As promised, I am sharing recipe of Basic pizza dough today. Incase you are thinking that there's going to be a lot of hard work before you can crack the recipe, let me tell you that making pizza dough at home is a piece of cake. It will become a weekend tradition for the rest of your life to make pizzas. All you need is good quality yeast, flour, olive oil and you are good to go! Key here of-course is the timing and measurement. It's very important to follow the recipe. For those who prefer whole wheat pizza dough, you can try adding half to half flour and wheat flour. I am yet to experiment the same. With summer vacations approaching, kids are going to be home all day and mothers will need to make their hungry kids happy. Everyone loves Pizza and anything in mini form is loved even more! Mini pizzas bake faster with a thin crispy crust. Its so much fun to lay out all the toppings like onion, olives, bell peppers, babycorn, zucchini, sun-dried tomatoes, fresh herbs and let your kids make their own pizza. Kids love to be involved in cooking and relish their food more that way! My first trial of making Pizza dough didn't work out all that well. It was chewy, hard and boring. But when I tried it for the second time, this was what hubby had to say "You made a mistake making it, you will have to keep making it often now". That smell! Whole kitchen was smelling as if we had step inside a Pizza deli! Why yeast? It helps flour to rise. Why sugar? It acts as a food for yeast to grow and fill dough with thousand of bubbles. Why lukewarm water? It helps yeast to get activated. Pizza is a simple dish which can be very easily made at home. Home made Pizza using my pizza dough recipe and marinara sauce is so darn delicious and oozes with flavour! Again when it comes to Pizzas, you can be creative and really make any pizza of your choice. Next up on the blog will be recipe of Classic Margherita Pizza. I am also going to suggest some variations which I really enjoy eating. Home-made pizza dough for those perfect crisp pizzas for dinner/lunch/parties. Mini-pizza with different toppings present themselves as an excellent appetizer for hosting a party. Mix 2 Tsp dried yeast with sugar in lukewarm water. Let it stand for 15 minutes. Tip in flour in a deep glass bowl and add salt and mixed herbs. Mix properly. Now make a well in the middle and add 2 Tbsps of extra virgin olive oil. Pour frothed yeast into the flour along with lukewarm water. Bring flour in gradually from the sides and mix in properly. Once the dough has come together, work it on a smooth wooden/tiled surface to have a smooth and springy texture. Place the dough in the same flour-dusted bowl. Spread 1 Tbsp olive oil on the top of dough. Cover with a kitchen towel and place the bowl in a kitchen cabinet for an hour. After an hour, punch the dough and knock out the air. Knead it again for a while to smoothen it. Divide into 4 parts. Roll each part into a ball and arrange in a dusted tray. Cover dough balls with kitchen towl and again place the tray at a warm place for further 15 minutes. Pizza dough is ready to be rolled and baked. If using the same day, it can be stored in refrigerator for upto 12 hours in a zip lock bag. 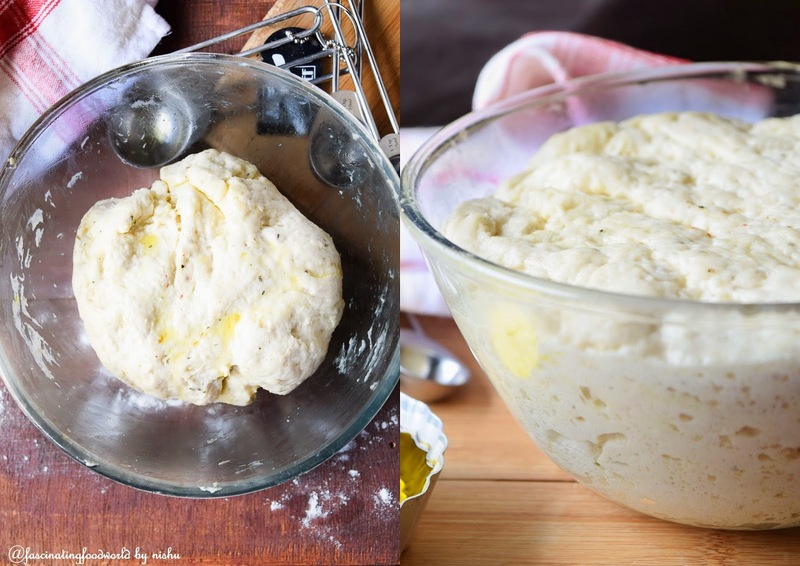 Please don't skip adding olive oil because it gives dough its phenomenal flavour. If dough becomes too wet, add in some flour. Don't forget to punch and knock out all the air once dough has fully risen. Water shouldn't be too hot nor too cold. 10 seconds in microwave is perfect for this recipe. If you try my recipes, don't forget to take a photo and tag me as #fascinatingfoodworld on Instagram and Facebook.